It’s the same principle behind supporting your income with multiple streams of revenue, hedging your investments with a diverse portfolio or simply having a plan B or C. A targeted, multichannel marketing strategy gives your business more opportunities to find, attract and retain the types of customers who’ll love your business as much as you do – maybe even more! With Valpak’s print and digital solutions, you can unleash a marketing campaign that’s precise and pragmatic. The low cost of digital marketing paired with our shared-mailing concept makes it affordable for businesses large and small to reap the benefits of print and digital synergies. When combined, direct mail and digital marketing solutions have a 28% higher conversion rate, on average, compared to single-channel strategies. There are many factors that go into increasing conversion rates with combinations of print and digital marketing: reach, message reinforcement and more. For Valpak of Chicagoland, multichannel marketing campaigns also benefit from our precision targeting and detailed tracking. Along with our rich neighborhood data, our targeting resources ensure your brand’s ads find the consumers most likely to act on your offers. While targeting your audience, you might just find that your core customer looks a lot like the typical Valpak consumer with higher home values and a higher likelihood of redeeming your coupon offers. Classified newspaper ads and other outdated advertising channels lack the precision needed to be sure you’re paying for marketing content that only goes to your target demographic. Local classified papers and ad space in newspapers cast a wide net. But are your ad dollars really being put to the best use if you’re advertising home improvement services to a neighborhood that mostly rents? What about automotive services to an area with high ‘L’ ridership and low private transit? Home health care in a neighborhood with very few seniors? Like advertising on Super Bowl Sunday, placing an ad in the Chicago Tribune was once the surefire way to put your business on the map and get people talking about it. But as news and information continues its transformation and decentralization, classified ads alone just aren’t enough to build up awareness about your business. What you say matters. Just as important: how your brand says it matters. Valpak of Chicagoland helps each advertiser’s offer make the most of its time in the hands of consumers. Our lean ad design takes cues from roadside billboards with a clean layout and concise ad copy that leaves no room for confusion, maximizing the time each recipient will spend considering your offer. Web development: Your ads will look great across all devices with web content that scales beautifully from smartphones and tablets to laptops and desktops utilizing responsive web design. Search engine marketing: You’ll put your ads in front of the right eyes at the right time when they’re searching for goods and services like yours. Search engine optimization: You’ll increase the likelihood of relevant consumers finding your business because they’re looking for what you offer. Social media marketing: You’ll forge deeper relationships with consumers on their favorite digital platforms, including Facebook and Twitter. Even in the Chicago suburbs, the glow of some of the Windy City’s largest and most lucrative businesses can make it hard for small and midsize businesses to shine. But Valpak of Chicagoland, a full-service marketing agency, can amplify your brand’s message to increase sales and raise awareness beyond your neighborhood. Complement your direct mail advertising with our digital marketing solutions, which will continue selling for you across the Chicago suburbs – even when your storefront is closed for the day. And stay in the know about where your ad dollars go by leveraging our performance tracking tools. Ready to climb to new heights? Talk to Valpak of Chicagoland today to learn just how cost-effective our print and digital solutions can be for advertising in the Chicago suburbs and driving new sales for your business. 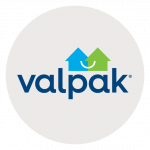 Join Valpak’s Blue Envelope of coupons to reach tens of thousands of select households in your slice of the Chicago suburbs and Chicagoland. Advertising areas include Arlington Heights, Aurora, Barrington, Buffalo Grove, Des Plaines, Evanston, Mount Prospect, Northbrook, Palatine and more. For specific dates and coverage, contact your Valpak of Chicagoland representative. Brian Hobson, the owner of Brian Hobson Karate Studio, chose to advertise his fitness business with Valpak because of its brand recognition and clout with local consumers. With Valpak, he can pick and choose the area codes he wants to mail to, knowing where most of his clients come from. Brian is happy with the control he has over where his brand’s message of value goes and appreciates his local Valpak media consultant’s honesty on which solutions work best for his business category. Contact Valpak of Chicagoland for effective Chicago suburb advertising for your health and fitness business.